I’m not entirely sure if this is serious. Note the date: June 2015. 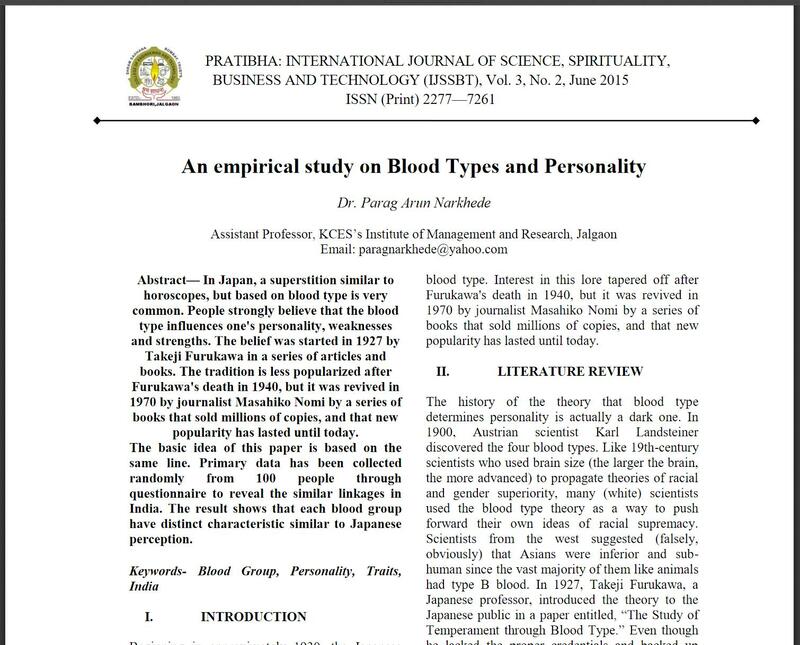 The basic intention of this paper is to correlate & compare this Japanese philosophy with Indian Blood Traits. As a pilot study Questionnaire was prepared considering different traits of personality along with annual income, Blood group and occupation of respondents. The questionnaire is distributed among 100 respondents to take their feedback out of which 90 responses have taken into consideration for further analysis. The data analysis has been done with the help of IBM PASW software using cross tabulation. I’m not as interested in the software that they used as I am in the survey methodology. A person belongs to ̳AB Blood type adapts well in changing situations. In computing, we have an expression “garbage in, garbage out” that applies to a lot of studies, especially this one. Type O: A person belongs to O blood type are the social butterflies. Often popular and self-confident, very creative personalities and always seem to be the center of attention. Always make a good impression on people and you‘re often quite attractive. Organized and determined, their persistence will helps to reach their goals. These people are good leaders & prefer to live in peaceful or friendly environment. It was good of the author to throw in that culture, diversity, religion, and family conditions also have significant contributions in shaping individual personality. So, here’s the problem: how does the author know that an individual personality has anything to do with blood at all? This is an absurd example of a bad social science paper, but it illustrates one of the inherent problems in measuring something when there are multiple factors that may influence an outcome. It also illustrates one of the problems of asking for “peer reviewed papers” – who are the peers and how well did they understand the material? I think that the only thing I’d be willing to conclude from this paper is that 9/10 of the author’s friends can fill out a survey. Assuming he didn’t just plug numbers in. If there were 100 surveys given out, why are there only 90 responses? Also: how were the survey respondents determined? Was it a bunch of undergraduates responding to the survey in return for a cookie? Was the sample group randomized. I’m more baffled by the fact that their response rate was so high — 90% is a phenomenally successful rate for a survey. What incentives were given? Wait, I just noticed the title of the journal: The International Journal of Science, Spirituality, Business, and Technology? That’s quite a mish-mash of words and concepts. Aldous Huxley fell for the blood-type-influences-personality spiel too. In his 1963 Literature and Science*, he proposed that writers should take such factors into account when describing characters’ personalities, opined that groups with different blood types would have frictions due to differing proclivities, and, noting that Middle Eastern populations feature an admixture of “psychologically incompatible” types, predicted continuing political difficulties there**. *Which irked me considerably by not even once mentioning a subfield called “science fiction”. **Gotta admit, he nailed that one good. Yes, the International Journal of Science, Spirituality, Business and Technology is such an excellent journal that it doesn’t even have an impact factor (link). This is an example of a practice common in Asia where institutions have their own homebrew journals that will publish any and everything that anyone at the institution wants to. Nothing is legitimately peer-reviewed, and the chances of finding actual good science in any of them are like the chances of finding truth and wisdom in Donald Trump’s tweets: if it ever happens, it’s purely by accident. This sort of practice is an example of why Asian science has been trailing far behind American science. No, not really, it has nothing to do really with social science. It is nonsense but that’s not an issue. It is as invivoMark @ 2 says. It is more likely a matter of job security. The journal is a junk journal probably intended to give local authors enough “publications” to keep their jobs or keep naive funders giving. If anything, it is lower than the bottom-feeding pay-to-publish journals if that is possible. Well, I’d question that sweeping statement but I’d say in many cases the problem is separating the wheat from the chaff and in some Asian countries we seem to see a lot of chaff. But then, given the number of retractions, etc, recently in the USA, (shrug). Oops forgot. If you Google the sponsoring college, it seems to have some serious accounting problems which does not increase one’s confidence in the journal. Yeah, it is. It’s about behavior; whether they want to own it or not, it’s psychology, or evolutionary psychology. But more telling, to me, is that the methods are quintessential social science: survey-based analysis of self-reported subjective states. The results are garbage (because of sample bias, etc) but the methodology is the methodology that has been used and promoted by social scientists all along – other than that the sample is biassed by the horrible questionnaire and questionable sampling – this is not that different from what Altemeyer’s survey did. [stderr]. I have a general problem with that entire epistemology, and the social sciences’ replication crisis appears to be bearing on that point. The journal is a junk journal probably intended to give local authors enough “publications” to keep their jobs or keep naive funders giving. Yeah. Part of the war on authenticity, then. Don’t worry, we appear to be working hard to “catch up” with the trailing edge.